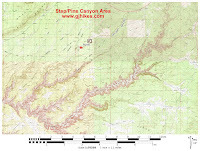 Step Canyon is a tributary of the Grand Gulch that is located in the Cedar Mesa Area near Blanding, Utah. 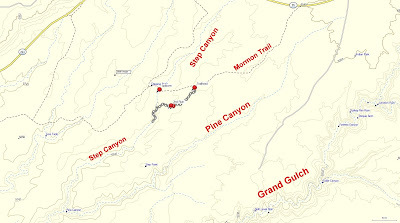 The main branch of Step Canyon stretches for over 7 miles from its upper reaches down to the Grand Gulch. This post covers a side branch where there are several ruins and a few pictographs as well as a short section of the main canyon itself. To get to the trailhead drive northwest on UT-95 from Highway 191 for just over 34 miles. Look for San Juan County Road 2301, the Mormon Trail, on the south side of the highway across from the west end of a long parking area that is on the north side of the highway. After passing through a gate there is a kiosk where the requisite fee can be paid before preceding. From Highway 95 measure 2.7 miles to a large area of slickrock with a cairn that marks the trailhead. The road is very smooth except for the last couple hundred yards. Many people choose to park when the road first starts getting rough and walk the last little bit. 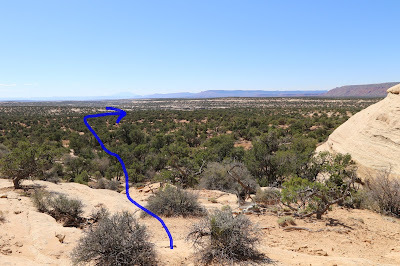 When you begin hiking don't follow the Mormon Trail any longer but head south across the slickrock and a little to the left to find a spot to descend off of the sandstone dome. With no marked trail to follow the general idea is to plot a route over to the nearby drainage in the southwest direction. 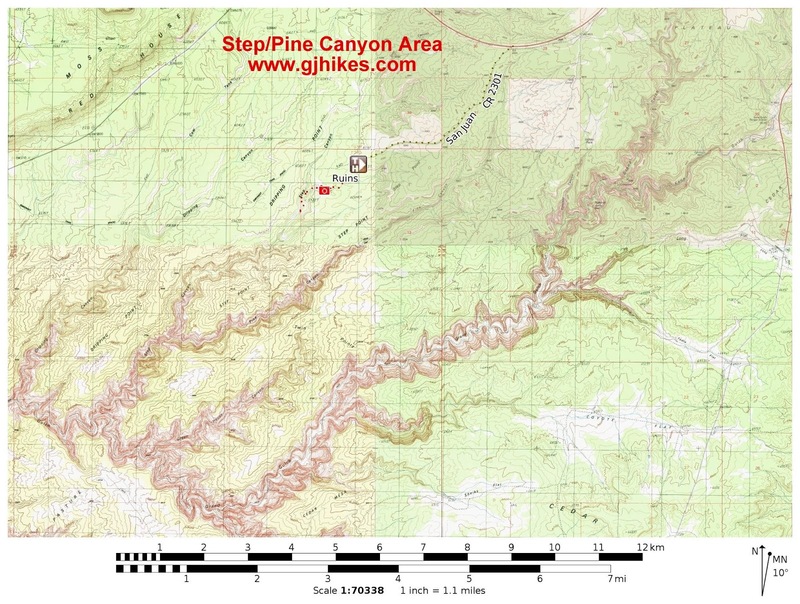 We made a little map that shows the location of the ruins in the side canyon in comparison to the trailhead and the main branch of Step Canyon. 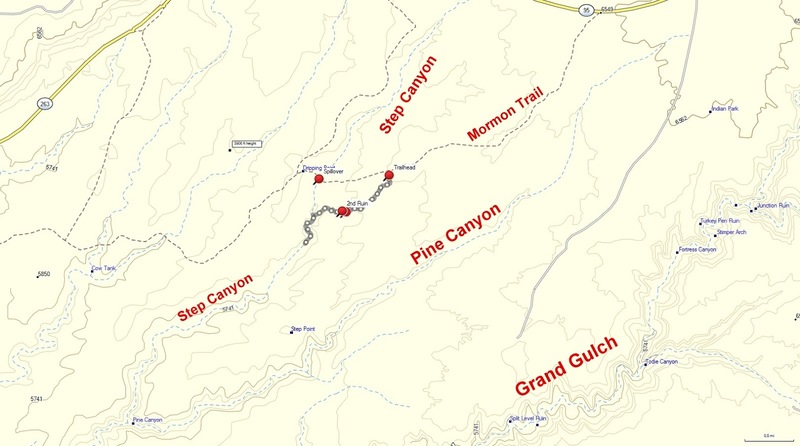 The main branch of Step Canyon has a large spillover near the point where the Mormon Trail crosses it that keeps someone from hiking down the canyon from that point. That makes the side canyon with the ruins the best route for hiking down Step Canyon toward the Grand Gulch. The route is easy to follow once the wash is reached. While hiking the wash we would occasionally notice a shard of pottery that was probably washed down from some location further up the wash. The crux of this route turns out to be a large spillover at the point where the wash begins transitioning into a canyon. 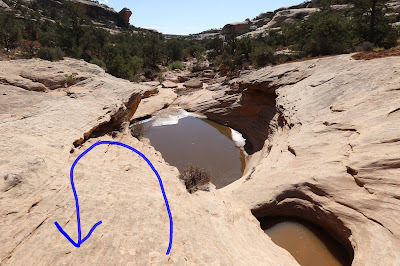 We arbitrarily chose to hike around the slickrock on the right until we found a suitable spot where we could easily climb back down into the canyon. Hiking gets easy again once you get back into the wash.
Once back into the wash it is only a short distance until the first ruin can be seen on the right. The ruin consists of a granary and a few other structures that are in various stages of ruin. This site also has a some pictographs where a few painted hands are still discernible. The second ruin which has a pair of nice looking granaries is only a little further away. A little past the ruins the wash travels down a long sloping stretch of slickrock that is kinda fun to hike down. At the bottom of the slickrock the canyon gets narrow and congested with brush. The brushy stretch only lasts for a short distance before the side canyon merges with the main branch of Step Canyon. Once in the main branch of Step Canyon the hiking gets pretty easy. For this post we turned around at some potholes that came up before reaching the junction with Pine Canyon. This post is more of a 'side step' of Step Canyon than the canyon itself and might get renamed at some future time after we have time to explore the main canyon. 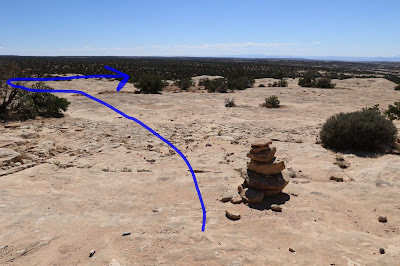 For those that are looking for a moderate hike that is only around 2 miles round trip and includes a couple of small ruins then this should prove to be a worthy option. If you would like to see it for yourself then all you have to do is 'Take a hike'.